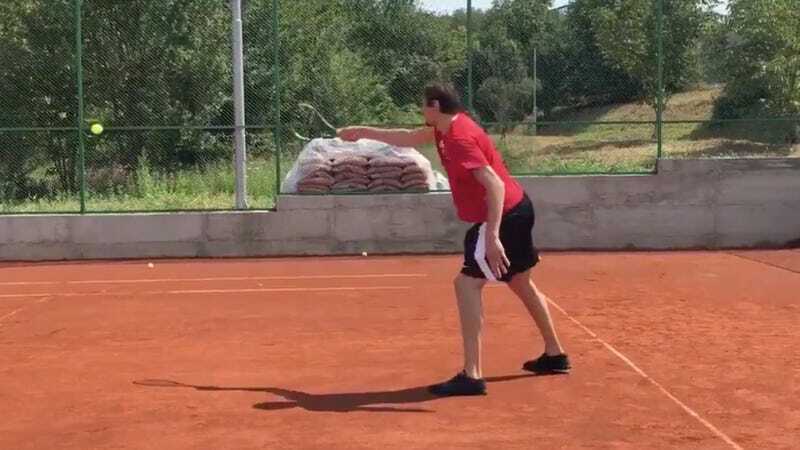 Boban Marjanovic appears to be spending some of his offseason back in his native Serbia, which has produced tennis stars like reigning Wimbledon champ Novak Djokovic and former No. 1 Ana Ivanovic. As tall, smooth-moving players with big serves increasingly find success in the men’s game, it’s become tempting to wonder what an elite basketball player might be able to do on a tennis court, given time and training. With that lateral quickness, imposing wingspan, and serve trajectory, it would be good fun to watch an NBA player get accustomed to a tennis racket. Big Boban does not yet look accustomed to a tennis racket, or this earth. But I’d still poop my pants if he charged the net.